SEASON'S READINGS! KILLER CHARACTERS' AUTHORS ARE GIVING AWAY A BOOK EVERY DAY IN DECEMBER! “It doesn’t make us sound stupid or inept,” Elsie disagreed. “I think it’s a good start to the book. What’s the name again? WIN A COPY OF SPELL BOOKED and a broomstick book mark, BY LEAVING A COMMENT! I am really looking foreword to reading this new series. Congrats. Absolutely love your mysteries! I am looking forward to this new series! I love your books. I would love to win this. Thanks for the chance. 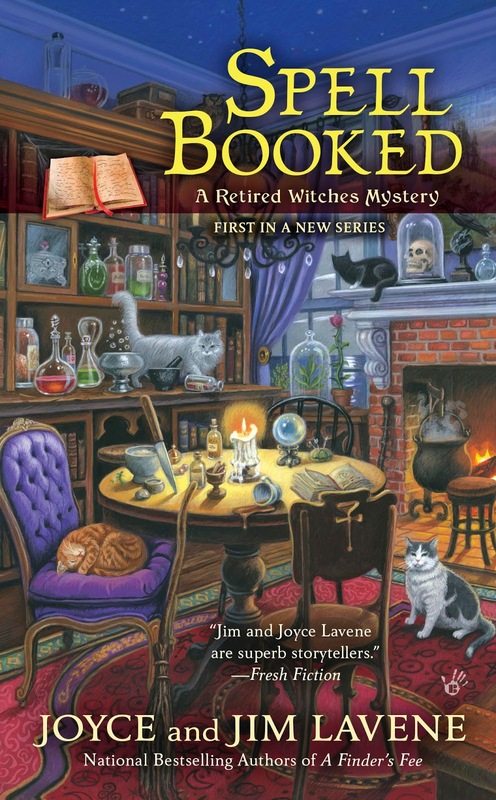 I love the work of the Lavenes—thanks for the opportunity to win a copy of Spell Booked! I agree. Wait for HBO. I shall see you there. What fun! I'm sorry I'm just seeing this, but oooh I hope I win! Retired witches + AARP = must read! I just retired this year so this book is a MUST read for me. I've read some of the other series of the LaVene's so I'd like to try this one. Really looking forward this book. Looking forward to reading this series! Love the story line! Sounds like a fun book! I'm looking forward to reading it! This series just fascinates me. I guess getting older and retiring affects everybody, even witches! Thanks for the giveaway. This will be the first book I've read by you, but it sounds like a great read. Omg this is a must have. Thanks so much for the chance to win!! This is a terrific writing team. Only hope to be lucky winner. Oooooo! This sounds like so much fun! I have to go to book store. Definetly going to look this up. I can not wait to start reading your new series!!! I look forward to reading them all. This looks like a fun first novel in the series. Sounds good and I really love the cover! Joyce and Jim Lavene always come up with a great new read. This one is the start of another one. These books look so good. Really excited to read this one. Lots of buzz about it. The cover is fantastic. What a great premise for a new series. Thanks for stopping by everyone! Judy Dee is our winner! Happy Holidays! Sounds like a great book! Looking forward to reading this! So happy for your new release, Joyce and Jim. Would love to become the recipient of your book; I need diversion to my life as it has been going and this would be a fun book to do just that. Thank you for the chance to enjoy your great sounding book. Cynthia. I love these authors. Looking forward to reading this great series.